15. Donnel: There was a moment, while I was writing up this gallery, that it was just “Donnel” copied and pasted fifteen times. That wouldn’t have been a bad list. Everybody loves Donnel. He’s got down-home country charm that you’d be a plum fool to resist. Also his stats are pretty great. He’s a good all-rounder. It feels good to slay a wyvern with a dude wearing a cooking pot as armor. 14. Tharja: You want Tharja on your Fire Emblem crew every bit as much as you want her in your squad when you roll up in the club. (I’m told that’s a thing you do, in the club. “Roll up.”) Hall & Oates wrote songs about girls like Tharja. Specifically about how she’s got abilities that grant her bonus damage when she’s at low HP. “Watch out, boy, she’ll chew you up.” I’m pretty sure that’s what they were talking about. 13. Camilla: Aw, man, did I use my “Maneater” joke on Tharja? Dang. Are there any ‘80s pop hits about a sultry lady riding a dragon and wielding a colossal axe? Because that’s what Camilla brings to the party. All her abilities are bent toward her getting the first strike, so if you’re getting the drop on your enemy she can do a truly hilarious amount of damage. 12. Leo: Leo’s a little haughty for my tastes. I like a fighter who isn’t too proud to wear cookware on their head. But you can’t argue with a guy who can attack at range and is mounted cavalry, meaning he can move three spaces in a turn. It’s not uncommon for Leo’s attack range to be 75% of the map or more, and on top of that, his abilities let him do area-of-effect damage to multiple enemies outside of combat. I’m just saying he’d be prettier if he smiled a little. 11. Nowi: I almost left Nowi off this list because her outfit is extremely upsetting, but I’d be remiss not to mention that she’s one of the few melee units that can counterattack at range and that her special abilities let her debuff enemy Resistance over a wide swath. Solid addition to your army if you can look past the heart-shaped garter clasps and thigh-high boots on a thousand-year-old pre-teen dragon girl. 10. Fae: Fae offers all the awesome dragon-power of Nowi and none of the eye-averting style. Her defense isn’t quite up to Nowi’s, but she makes up for it by healing herself for 10HP every other turn(! ), as well as debuffing enemy Attack. She can also drag your other characters out of danger, which isn’t helpful often but occasionally can save your skin. There are a handful of little kids in the Fire Emblem Heroes character pool. Fae’s the cute one. 9. Corrin (F): The girl version of Corrin, from Fire Emblem Fates, is kind of like FemShep from Mass Effect: Did anyone claim to play Fates as a guy, and if so, why are they lying to you? Corrin is all about buffs and debuffs: Her weapon lowers enemies’ Attack and Speed, and her abilities let her lower their Resistance as well as buffing allies’ Attack. As long as you don’t put her around any axe-wielders, she’s tough enough to handle most foes. And yes, she too is a girl who transforms into a dragon. 7. 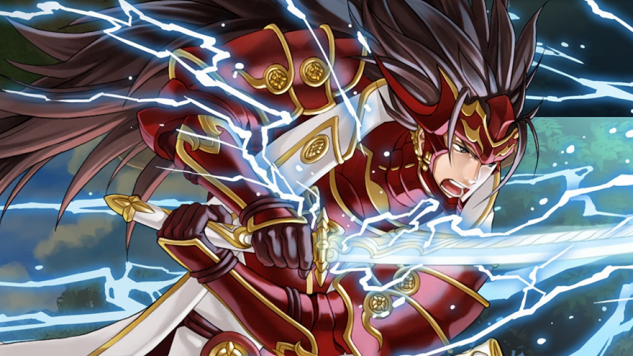 Ryoma: Less of a dragon and more of a giant hedgehog, Ryoma makes the list because his Attack stat is through the roof and all of his abilities are bent on boosting his damage even further. Oh, and also he can counterattack from a distance. Basically, unless your enemies can hit him with powerful magic and kill him in one blow, he’s a spiky-haired samurai Terminator. 6. Lyn: Ah, Lyn. Those of us who first encountered Fire Emblem through the 2003 GBA title became series fans for life, smitten instantly because Lyn is perfect. Was it her smile? Or was it that she could tear through that whole game like a katana-wielding whirlwind, leaving utter devastation in her wake? In any case, she’s formidable in FE Heroes as well—she’s got all of Ryoma’s crazy power, only she gets both her attacks before her enemy can retaliate and her special ability lets her take a second turn. She’s a wonder. 5. Lucina: Lucina has traveled back in time from a dark future to kill every dragon she sees. Not only is her Falchion wicked powerful against all those little girls earlier on this list, but it also restores her HP every third turn. She also gets a huge buff to her (already considerable) speed if she’s at low HP, meaning there’s a serious chance that she’ll get one of those quadra-attacks that keep killing me in the Arena. A dangerous, dangerous Hero. 4. Robin (M): It’s a mystery as to why FE Heroes launched with male Robin available and female Robin locked away, but if Robin’s lady counterpart arrives anywhere near as powerful as he is, she’ll be a forced to be reckoned with. Robin doesn’t have much in the way of special abilities, but his magic book grants him weapon advantage over colorless enemies, meaning his weapons triangle is more of a “weapons rhombus.” It’s deeply unfair. You want that on your team. 3. Cordelia: Alright, caveat: This only applies to a five-star Cordelia, so if you’ve got a four-star you can throw her right in the bin. But: Cordelia’s five-star special ability is the same as Lyn’s, in that it lets her take two turns for the price of one. She also comes with a weapon that nerfs her speed but lets her attack twice if she initiates combat. Also her passive ability lets her move through foes. Add all this up and she is a guided missile of a character, laser-targeted to destroy enemies before they have a chance to move. 2. Hector: Hector. My man. Big guy. Hector appears in Fire Emblem Heroes pretty much as he did in his native Blazing Sword: If you can keep him away from any mages, he will destroy everything in his path, cutting down enemies like a farmer scything wheat. Hector can counterattack from a distance. He gets a guaranteed second attack when he’s at high health. His Attack and Defense are crazy. Just keep him away from magic users. 1. Takumi: Sigh. Look. I don’t like it. You don’t like it. But here we are. Takumi is the best character in Fire Emblem Heroes. Look at him, with his dour expression and his haircut that makes him look like a tropical fruit. I wish it was someone else. But Takumi is a ranged attacker who can counter melee, he can move through foes, and he’ll nerf your speed so he gets to attack twice and you end up dead. Takumi is the gacha game version of a nuclear arms race: Everybody’s trying to get him on their team because everyone else seems to have him already, and we want to use him on the enemy before they use him on us. Until we can all sign some sort of Takumi nonproliferation treaty, you better get your top scientists on getting a Takumi of your very own. That’s just the world we live in these days. Fire Emblem Heroes has a lot of characters. Dozens, in fact. How on Earth do you choose which among the multitude deserves a place in your extremely exclusive four-person battle squad? Well, you could simply choose characters you like—but that’s no way to play a game like this. You want to be the best! You want to crush your enemies, see them driven before you, hear the lamentations of their waifus! We are here to help you do just that. Put these hardened warriors at the vanguard of your tiny army, and you will emerge triumphant from every skirmish.